There was plenty of material for the Federal Opposition Leader to work with as he delivered the budget reply. But it's hard to tell how much of it merely reflects the diabolical nature of the proposed changes to longstanding social compacts such as universal healthcare and youth unemployment assistance, and how much signals a genuine, substantive escalation of Labor opposition. If the response from the public gallery and social media is any measure, then Prime Minister Tony Abbott and Treasurer Joe Hockey may have just done Bill Shorten a huge favour. In the decade under John Howard, Labor leaders in opposition slid to the middle, perhaps in the belief that offending the least number of people was a suitable strategy for winning office. Kim Beazley and Simon Crean, with three turns between them, were an unremarkable blur. Mark Latham proved a combustible anomaly. Then came WorkChoices. It came into effect in March 2006, exempting companies with under 101 employees from unfair dismissal laws, removing the 'no disadvantage test' for workplace agreements and restricting industrial action. Kevin Rudd became leader of the Labor Party later that year. Notwithstanding his merit as a candidate, including that his candidacy came at the tail-end of Howard's fourth term as Prime Minister, there is no doubt that the unions-led campaign against WorkChoices was pivotal to handing government to Labor. In other words, successful opposition seems to rely heavily on people getting terribly het up about something. But it takes a clever opposition leader to channel this in his favour. What Shorten has been handed this week is several WorkChoices with which to galvanise people. He needed it. Since he became Labor leader in October last year, the running gag whenever someone mentions the Opposition Leader is to feign shock and say 'We have one?' It seems harsh until one takes into account the tepid response over the past few months to the strangulation of the Gonski school funding reforms, the National Broadband Network (NBN) and DisabilityCare (NDIS). These are legacy items. Frankly I had expected far more screaming and eye-gouging from the Opposition. A bit of blood on the floor, even. I'm not alone in my exasperation. Prior to the Budget reply, the descriptors people offered to me about Shorten included 'invisible', 'wet lettuce' and 'damp loo paper'. These are people I think of as critically engaged and progressive. It's not a good sign when natural allies think you're letting them down whether or not you turn up. Shorten should find their disappointment encouraging. Despite the abysmal theatrics of the past few years, complicity in ever more severe immigration policies, the persistent threat from the Greens and ensuing punishment at the polls, Labor is still — perhaps inexplicably — expected to have something to say. People expect it to say so forcefully, with the ring of conviction. They want it to get in the way of the Coalition. Shorten seems to have delivered last night, offering a glimpse of the sort of Opposition Leader that Australians deserve. Those who had expected a bland presentation were caught by surprise, which is probably the nicest thing that has been said about a Labor leader in a long time. The speech employed revivalist Labor rhetoric regarding family budgets and equity in education. But it also prioritised battlegrounds that set up a poll-friendly fight: the six-month delay for Newstart payments for unemployed under-30-year-olds, the loss of family tax benefits when the youngest child turns six, the $7 co-payment for GP visits and the $80 billion cut from schools and hospitals. There is an element of predictability here, of course. The hazard of being in Opposition is that you oppose, the terms of your reaction set by somebody else. People tune out. This is why Shorten's anaemic presentation style has been a liability. He can take better lessons in this regard from Julia Gillard's failed salesmanship than Abbott's scorched-earth opposition strategy. Labor made that strategy effective through its own missteps and internal conflicts. It is therefore too simplistic to suggest Shorten mimic the hollow thuggery that became the Coalition's signature. Nor would it be enough for him to reason sensibly with the public, a strategy that failed Julia Gillard spectacularly. Somewhere between these, Shorten might be able to craft an approach that will unlock the support of the majority of Australians. The Federal Budget has given him plenty of opportunity to do so. We can only hope it won't be squandered. You conveniently forget htat the biggest weapon in Labor's arsenal in 2007 was simply boredom and complacency with the longevity of the Howard government and the continuned rolling on of the good economic times. Shorten has momentously failed to capitalise on the first and austere Abbott budget and I strongly suspect he won't make up any further ground simply due to the public being so turned off Labor. I think most Australians will accept the budget, with a crude understanding the debt situation, and most will lay the blame for it squarely upon 6 years of Labor excesses. Palmer might be having a slight boon in the polls but his own mouth will run him out soon enough. And the Greens..well...Christine Milne is about as inspiring as a wet blanket. I know you may dream of a return to the glory days of the first Rudd government Fatima, but your dreams are exactly that, dreams. The age of middle class welfare, open borders and the spewing of climate change nonsense is well and truly over, and it could not have come sooner. "Nor would it be enough for him to reason sensibly with the public, a strategy that failed Julia Gillard spectacularly." That 's the biggest laugh in this barrel, Fatima! Little Willie Shorten is large on rhetoric and short on values. He hasn't offered one constructive thought, promise or idea. I am a retiree. I am blessed with sufficient part time consultative work not to have to rely solely on the aged pension. I had decided that the difference between both major parties was negligible. Tis budget has changed that. Now it is clear that the coalition is the party of the affluent. That any changes to the superannuation set up and to negative gearing were never even considered is proof of this. Labor is obviously the party of the workers and the disadvantaged. I abhor Labor and Liberal's treatment of refugees. That both parties seem unmoved by our annual horrendous abortion rate, justified by the euphemism of reproductive rights, is another concern. Maybe if Bill Shorten gets his way I can join the ALP and fight these battles. I doubt, however, if I will ever again give the coalition a second thought. Come to think of it I am a union member so I can join even if ALP membership remains restricted. Shorten's speech was ok. But what undid any of the efficacy of the gig in the Parliament was his avoidance of giving straight answers when interviewed on the ABC after the speech. Tctics before spine. So much lost. Taking over as Labor leader after the Rudd-Gillard-Rudd again roller coaster ride, strewn with badly designed and badly implemented policies as it was, was always going to be difficult. I think Bill Shorten needed time to get used to the role and come up to speed in it. He apparently has. His reply in parliament to the Budget was spot on. 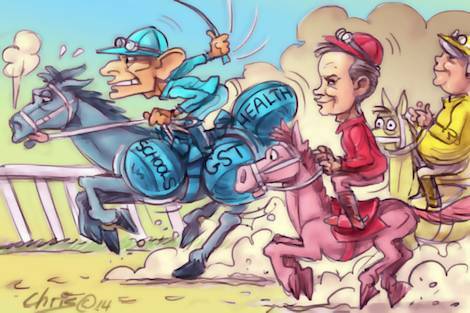 Given the way Australian politics works Shorten needs to keep up the attack. There is a place, outside the day to day wrangling of parliament, for a national debate about the sort of society we want and the long term direction we want it to move in. We need to realise that economics serves society rather than vice versa. Of course we need prudent financial management. What worries me about the Abbott government's approach to economic management is that it appears to be hell bent on destroying our accepted safety net for the most disadvantaged and replacing it with a system horribly reminiscent of 18th Century England. Weekend polls spectacularly confirm Fatima's on-the-ball analysis. Time for Labor, Greens and PUP to work together fir earliest possible double dissolution and general election. The coalition govt has betrayed voters and betrayed Mainstream Australian community values. They really are Tea Party ideologues and they will destroy the Australia we love. I agree with Grebo that although Labor is flawed, Coalition is entirely beyond redemption now. Go for a DD, people! Labor under Bob Hawke went along the same path not too many years ago and we ended up in recession and housing interest rates of 17.5%. It took Keating to beat some sense into the Labor party and John Howard continued the policy of good management. Our family will have less to spend under the new budget, but nobody will suffer as much as people will when housing interest rates go back to 10%, 15% or 18%! Instead of having less, many families will have nothing. The choice is simple, a little bit less now or nothing in the future! Anybody with a $250 000.00 mortgage should ask themselves if they will be able to pay another $500.00 a week in housing repayment. If yes, then they are rich enough to vote Labor or Green, if not, the current budget should make a lot of sense to them. If people are on a lower income, the interest rate hikes will hurt them even more and they may have to find over $500.00 more in weekly rentals. I agree with the sentiments in this article, especially the disappointment about Shorten's invisibility since becoming Opposition Leader. What I found disappointing about his Budget reply speech though was that, as Joe Hockey said, it was very short on detail.Hockey though has a short memory. Tony Abbott's Budget reply speech last year was exactly the same, although it went further in being an arrogant "we're ready to govern" speech. It seems the lack of policy detail in Australian politics has not changed in the last 12 months. For those who lost a loved one through cancer, motor neurone disease or any other terrible disease, we welcome Tony Abbott's budget. Not only he is fixing the mess he has inherited from 6 years of Labor, but also he is preparing for the future generation of Australians, "Medical Research Future Fund". Instead of attacking Tony Abbott for putting Australia first, let us all pray that the Medical Research Future Fund will be a success and lives will be saved in the future. Nils - the ALP don't have to detail their policies in detail in the budget reply speech - if you want to know what they are look at their last budget: carbon price, mining tax, NDIS, Gonski, NBN .... To Grebo - here is a quote from the NY Times referring to a large study, which found: "“What we see is that the law does not influence a woman’s decision to have an abortion. If there’s an unplanned pregnancy, it does not matter if the law is restrictive or liberal.” But the legal status of abortion did greatly affect the dangers involved, the researchers said. “Generally, where abortion is legal it will be provided in a safe manner,” Dr. Van Look said. “And the opposite is also true: where it is illegal, it is likely to be unsafe, performed under unsafe conditions by poorly trained providers.” The data also suggested that the best way to reduce abortion rates was not to make abortion illegal but to make contraception more widely available" - those findings seem a good basis for sensible policy. Thanks for a great article. Let's hope those with negative comments about it have studied today's polls. Ron Cini, while I feel for your concern about raising money for medical research, dismantling medicare is not the way to do it. Fatima stated my feelings about Shorten. I had despaired of him until I saw his speech. It was passionate and I thought he may succeed in putting fire into the belly of the many who will suffer from the budget. I saw Hockey on Q&A last night and two things in particular struck me. Firstly, he came from a migrant family who made enough money to send Joe to an elite Catholic college. He remembers this, genuinely, as proof that you can pull yourself up by your boot straps to improve your situation. By looking through this prism he intends to motivate people by making life hard. After all, if Joe Hockey's family could do it why can't everyone! This, as most of us understand, is a very one-sided view of the world, one that lacks understanding of the situations of the many and therefore lacks compassion. The second thing I noticed about Joe Hockey's Q&A comments was that he kept pounding home the necessity of the budget and what it would achieve over time This was above all what he intended to convey to the audience: that Labor's reversal of the budget will ruin the economy and the whole way of Australian life. He doesn't have the vision to understand that the budget will increase inequality, fracture our society, and lead to increases in mental distress and crime. If Labor wants to maintain its momentum after the budget it must win the conviction of the majority of Australians that the economy was left in good shape before the election and that its promises can be kept. I think we'll be waiting a long time for Shorten to deliver. Another apparatchik and in the words of Keating: all tip and no berg. Did for me when he had the dummy spit over a cold pie!